Not too long ago TheGardenLady’s Jewish readers celebrated Hanukkah. Because Hanukkah is a holiday which is celebrating the pure oil found in the temple in Jerusalem approximately 2000 years ago, food prepared in oil is generally served on at least one of the 8 nights the holiday is celebrated. One of the most popular foods served at Hanukkah is the fried potato latke or pancake. This is a simple food to prepare and very delicious to eat. Grate a few potatoes with an onion, drain any water from the grated potato/onion mix and add matza meal or bread crumbs, one egg ( for each two potatoes) plus salt and pepper to taste. Mix, make pancakes, then fry in oil. Don’t crowd them in the pan. Let brown on one side then flip and fry on the other side. This is a poor person’s food from mostly Eastern Europe. You can change the main vegetable or mix vegetables or add different spices to the basic recipe. (see here) Emeril Lagasse adds parsley, thyme and lemon. This latke recipe seems tasty; but these are things that most poor people from Eastern Europe would probably not have had in their kitchens without refrigerators in the winter. 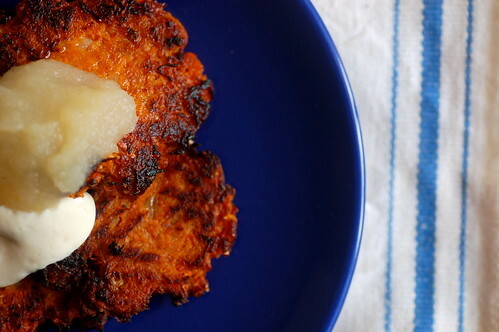 The food that goes well with potato latkes is applesauce. This is the best time to buy apples that have been freshly harvested. TheGardenLady does not buy applesauce because it is the easiest thing to make. I peel and core any apples that I have. I add water to almost cover and cinnamon to taste. I never measure. I boil the apples until almost all the water is gone and the apples are mushy. If I want it lumpier, I take it off the burner sooner. Then I cool the applesauce and refrigerate. I don’t add sugar but you can add some to taste. If you must use a recipe, this simple one will do. If you like nutmeg, you can add it. If you prefer maple sugar, you can add that instead of plain sugar.